But where are the flowers? HIGH temperatures have caused spring flowers to bloom earlier than usual in Uttarakhand disrupting the annual festivities. 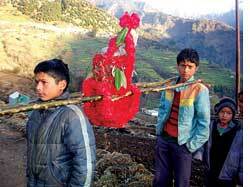 This has dismayed children in the Garhwal district the most because each year when they wake up before dawn to collect wild flowers like Rhododendron arboreum (burans), Prunus cerasoides (painya) and Rainwerdtia indica (fyunli), they return empty handed. "We haven't been getting the flowers for five years now because of increasing temperatures. The rituals to celebrate spring are done without the flowers," said Asha Khanduri of Shersi village in the Kedarnath valley. The festival, called ghogha, is to welcome spring around the end of January and bonding with forests and trees. Children do everything, says Maheshanand Semwal. They collect wild flowers and leave it at the doorstep before sunrise. The festival continues for eight days and children pray to the Ghogha Raj for good crop, monsoon and family's well being. "We consider new leaves poisonous and pray for the well being of livestock," said Khanduri. Harsh Prakash, another resident, said if the atmospheric temperature did not stop increasing, all the resources, agriculture and livestock linked to it would be lost. But there are a few who are ready to celebrate the onset of spring with mustard flowers.